Spec Bank: Behind the Spots: Boston Red Sox – "Cop"
Boston Red Sox – "Cop"
Pascal Leister: "I was looking to do a viral style commercial. When Dave’s script came around I immediately latched on to it, because I felt it was very cutting edge. It’s shocking and funny at the same time. The biggest challenge for me was to make this look like we stole the clip directly from a police camera and posted it on Youtube. Everything had to be hyperrealistic. The trick was to find an actor who could play a cop very naturally. I was lucky in finding Tom Biagini without a major casting process but just by asking my friends for recommendations. I found a quiet street in downtown L.A. after driving around the area for a while at night. I pretty much did the whole thing myself with just the help from a P.A. [Shooting] went very well. We didn’t get busted and everything worked out beautifully. 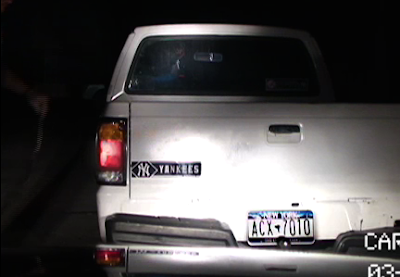 We only had 3 takes with the cop smashing the taillights, because we only had 3 replacement lights for the truck. We rehearsed the action extensively so we would have no surprises when actually shooting it. I think Tom (the actor) got a real kick out of smashing those lights. Editing the spot was the real fun part. Of course the edit itself was easy, but the challenge was to emulate one of those clips you can find on Youtube. So a lot of work went into the sound design and into making it look as crappy as possible but still maintaining essential details. If we had a budget I would’ve actually loved to shoot this in or around Boston and during daylight to get even more authenticity."